Background: IDX-184 is a guanosine derivative having a potent inhibitory performance against HCV NS5b polymerase. Objective: To test three different groups of 2'C - modified analogues of guanosine nucleotide against HCV polymerase. Method: Using combined Quantitative Structure-Activity Relationships (QSAR) and molecular docking, the suggested compounds are studied. 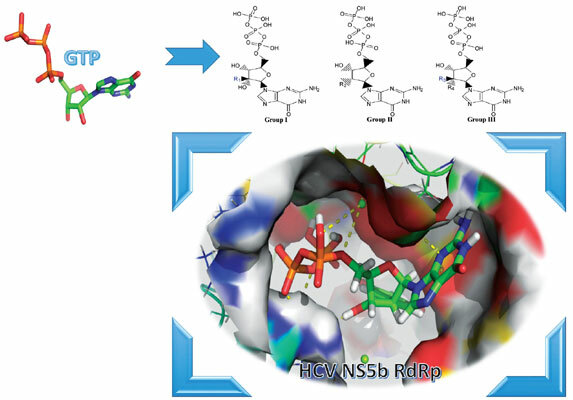 Results: Examining the docked structures of the compounds with experimentally solved NS5b structure (PDB ID: 2XI3) revealed that most of the compounds have the same mode of interaction as that of guanosine nucleotide and hence, NS5b inhibition is possible. Conclusion: It is revealed that sixteen modifications have a better binding affinity to NS5b compared to guanosine. In addition, seven more compounds are better in NS5b binding compared to the approved drug, sofosbuvir, and the compound under clinical trials, IDX-184. Hence, these compounds could be potent HCV NS5b inhibitors. Summary Points: Novel guanosine modifications were introduced in silico and optimized using QM. QSAR and docking calculations are performed to test the binding affinity of the compounds to HCV NS5b active site. Comparison between the binding affinities and the mode of interactions of the compounds and both GTP and IDX-184 is performed. Structural mining to quantify the mode of binding of the compounds to NS5b active site pocket. Keywords: NS5b polymerase, hepatitis C Virus (HCV), sofosbuvir, guanosine inhibitors, QSAR, protein-ligand docking. Keywords:NS5b polymerase, hepatitis C Virus (HCV), sofosbuvir, guanosine inhibitors, QSAR, protein-ligand docking. Abstract:Background: IDX-184 is a guanosine derivative having a potent inhibitory performance against HCV NS5b polymerase.